Polaroid Automatic 340 Land camera. A beautiful Classic camera which you can find for less than $50 but no Polaroid instant film available for these cameras. So it’s not exactly a cheap instant camera. If you are looking for a cheap instant camera then it shouldn’t be hard to find one. You can find an old Polaroid camera from E-bay or yard sale for even $5 but then problem is price of instant film. It’s not cheap to take photos with this kind of camera because film packs are expensive. But if you buy an old Polaroid camera which has no new film available then you will be in bigger trouble. So unless you really want one of these old classic cameras and have no problem paying $25 -$40 per 10 exposure film packs it’s better avoid these old cameras. A if you want a really cheap instant photo camera then you have to find a camera which use cheap instant film. When it comes to both camera price and film price Fuji instax camera are the best choice you have. So in this list of cheap instant cameras you will find only cameras with film not only cheap but also still in production. Camera price will be main point but also the price of film packs. because both these factors are important. You need a good camera with cheap film but also good photo quality. Remember these cameras are instant cameras if you are looking for camera which provide you ultra sharp images then you need to go for a digital camera and then you can print those photos with a good laser printer. So finally Polaroid Co. has launched a cheap Polaroid camera which has a below $100 price tag. It model comes in different colors and design looks really cute. 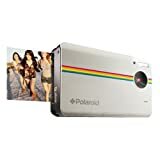 Polaroid Snap the cheapest instant digital camera in market today. It uses ink Premium 2×3 Photo paper which cost around 50 per print. That’s a really good price. If you were drooling for Polaroid Socialmatic Camera then here’s your chance to get a cute digital instant photo cam for cheaper price. 10-Megapixel Sensor Capture quality images and you can save all those photos to a Micro SD card upto 32GB. Snap model doesn’t have a LCD screen in back so you can’t check your photos unlike in Polaroid z340 camera. Fujifilm Instax Mini 70 is successor of Instax Mini 8 and it camera which has lot more features than it’s predecessors. It’s bit higher price than older fujifilm Instax models and cheap Polaroid cameras but but not a lot. Amazing thing about Mini 70 is it gives you extra sharp photos like no other instant photo camera. Not just subject but also background gets better. You can get more details and latest prices from below Amazon link. This new Hello Kitty camera has become a great hit among HelloKitty fans. It’s one of the Fuji’s latest versions but unbelievably cheap. Even thought it’s a unique design from outside camera is similar to Mini 8 model. If you want a cheap instant camera for someone who like pink or Hello Kitty, This is the best you can get. Not exactly a pocket camera but use Mini film packs. Instax 300 is the successor of Intax 210. Even though new cam has a beautiful sleek design it’s pretty much same inside. So if you already have the older model then it’s better hold on to it and wait for the next model. But you are searching for instant film camera which use bigger format photo prints then this might be the best one for you. Not everyone loves credit card size mini film, some prefer the old style 3×4 photo prints. It does come with few new features such as controls to manage high and low-key effects in the pictures. Also you can set it on a tripod. There is an optical view finder which comes very handy. Instax 300 uses Fuji Instax Wide film which cost you around 80 cent per photo print. These days you can buy one of these for less than $100 at online stores such as Amazon. The camera is powered by four AA batteries. You can take around 30-50 photo prints depending on flash usage. But it’s better buying a set of rechargeable AA batteries which will last longer and also very cost effective long term. Rechargeable batteries are very cheap these days and we recommend you to get Panasonic Eneloop batteries because those are the best in market today. Fujifilm Instax 210 Camera is the cheapest instant photo camera in market which has film still in production. You get buy one of these Instax 210 camera from Amazon for less than $60 with free shipping. This camera it bigger in size so not exactly a pocket size camera unlike Fuji Instax Mini series cameras. But it’s a lot better camera than those old Polaroid cameras. This camera has many features which makes it closer to new digital cameras. It has a LCD control panel displaying focal distance and film count, Automatic flash for low-light shooting, Two-range selectable shooting options and it comes with a big very clear view finder. Focus range is 0.9m to Infinity but you get two range selectable shooting options 0.9-3m and 3m-Infinity. This Instax 210 camera uses Fuji Instax Wide film. This is not same as Fuji Mini film. Instax Wide film format is similar to the Old Polaroid instant film size wise but you can’t use this type of film for those cameras. Cost per photo print is around $0.80 so it’s not really expensive like Polaroid instant film or impossible project film. Specially if you don’t like Fuji mini film which is only credit card size then this camera is your best choice. Now there is a new model called Instax 300 out there but it cost you around $130 – $150. It’s same camera and all features are same expect for newer design and more slim and elegant look. 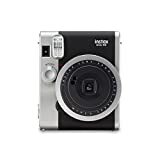 Fujifilm Instax Mini 8 camera can be bought only for $70 from Amazon with free shipping. It comes in 5 colors white, blue, black, pink and yellow. The price might be different depending on camera color. Yes it sounds crazy but that how Fujifilm sells it. But it’s a really good and simple camera and very portable too. Mini 8 camera is 10% smaller than it’s predecessor Fuji Instax 7s camera. There’s nothing fancy about this Mini 8 camera. It’s a simple camera and one of the cheapest instant camera models you can get today. It has an automatic exposure measurement which tells you the recommended aperture setting with a flashing LED. Also there is this new High-key mode which let you take bright photos with the soft look. This camera uses Fuji Mini film which cost you only around $0.70 per photo print. That’s around $0.10 less than the cost of Instax Wide film. This is an Instax Mini camera so you can use only Instax Mini film. You can buy a Fujifilm Mini Film Twin Pack (20 photo sheets) for around $10 -$13 from Amazon. This camera is great for anyone from small kids to Adults who had used Instant cameras before. It’s small and light also easy to use. You can power it with a AA batteries and these batteries are not hard to find either. You can save more money if you buy couple of AA rechargeable battery packs. So if you are looking for cheap instant camera with cheap instant film but which is still available and gives you reasonably sharp photo prints then This is your camera. Fujifilm Instax Mini 90 NEO Classic camera is not a cheap Polaroid camera or something simple like most of Polaroid models out there. This camera cost you around $170 -$200. But this camera is best the best one if you want a Polaroid type camera. This has more manual controls than any other Polaroid or Instax camera ever made. So you can do many things with this camera and photo quality would be lot better. Mini 90 comes with 3 focus modes which let you take Macro, Standard and Landscape photos. It has a several exposure modes for Double exposure and Bulb effect and also kids mode for fast moving objects and party mode for low light photos. Also you can control flash too. All these features makes it something different than entry-level instax models. Mini 90 camera uses Mini film just like all other Mini cameras. But this camera comes with a rechargeable Lithium battery which will let you take and print more photos. Photo cost is less than $0.70 so that put this camera among models which use cheap instant film. If you can afford it then skip those cheaper options and buy a Fujifilm Mini 90 camera. It’s better and worth all those other alternatives out there. A good long term investment than some of those toy like cheap Polaroid cameras. Only down side of this camera is there’s no USB port or internal memory. But it’s a fair exchange for what it can do. It’s few years older but this one has more punch than the Mini 8 camera. FujiFilm Instax Mini 25 has more manual features and gives you better control over your photos. One biggest improvements about this camera over older mini 7s or newer Mini 8 is you have more control over Flash. You are getting a close up lens kit and also there is a mirror next to lens if you want to take selfie photos. Camera cost you around $85 these days but if you want one of these Hello Kitty version then it might cost you more. It uses two CR2 batteries. There are rechargeable CR2 batteries and those might be cost effective in long term. One of the best instant cams released by Fuji. Only down side it has is these CR2 batteries are hard to find in local stores. So you it’s better find several pairs of rechargeable CR2 batteries. Price would be pretty much same but you will able to use these longer and also take more photos since rechargeable batteries have more capacity. This model is not so known but it’s a beauty and also next best thing after Mini 90s and Mini 25. Instax Mini 50s model comes with a some cool features like tripod mount and event has a self timer. It’s the successor of Mini 25 models so it has all features of it except the selfie mirror. It looks little different than rest of Instax models are looks more elegant. Mini 50s camera cost you around $100 at Amazon with free shipping. It uses Mini Film and powered by two CR2 batteries. This model is not easy to find in market specially in local stores. Apart from this piano black one there is while version which is even harder to find. Mini 50 look elegant and has most of Mini 25 features. But for some reason this model didn’t become popular like other Instax models. There is more rare white model out there in market too. Make sure to buy several pairs of rechargeable batteries along with the camera if you are going to buy this one. Fujifilm Instax Mini 7s revolutionized instant camera market. Mini 7s released to market in 2004. It uses Instax Mini film which is readily available everywhere. Not exactly a pocket camera. Also it’s little heavier than it looks because of four AA batteries it uses. It’s a nice camera and can be found for cheap now. But I don’t think it’s wise to buy this model anymore. It’s been over 10 years since the release and there are so many Mini Camera models out there which you can buy for same price or even less. Those newer cameras are improved versions so should be check those. For example you will able to find a Mini 8 model for even less than Mini 7s. This Fuji instant film camera uses Instax Mini film. Polaroid now only make these instant digital cameras and this Polaroid Z2300 is the cheapest model available. It has lots of features you don’t find in their older versions of Fuji Intsax cameras. You can save images into a memory card and move those to your phone or other device like computer. Z2300 cost you around $180 and it use Polaroid ZeroInk Instant film packs (Mini size 2×3 ). It’s the same thing known has Polaroid PoGo film packs but this new type comes without borders. But you can use PoGo film with this camera without a problem. Comes in five colors, Black, Blue, Red, purple and white. Polaroid Z2300 has a 10 Mega pixel sensor and you can use SDHC memory cards upto 32GB. Also has a nice 3 inch LCD view screen on back. One of the coolest things about this Instant digital camera is you can choose and prints photos you want discarding unwanted photos. This came save money which you waste on bad photo prints when you use analog cameras. This list should be updated. 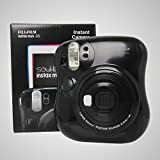 There are several nice and low cost instant photos camera out there which should be added to this list. For example Instax 300, Instax Mini Hello Kitty etc. I think Fuji Instax 300 and Fuji Instax mini Hello Kitty should be in this list since you can buy those camera for less than $100. Best cheap instant cameras out there are these two models. Other instant models ether too old or too expensive. You can skip all new Polaroid cams which everything cost you over $150. I don’t think anyone would want to pay $200 or more for an instant camera these days when everyone have mobile photos and laptops. you no longer need these except you really like it or just for events like weddings where a photos would make guest book really memorable. There is another new Instant photo camera out there. Fuijfilm has released the successor for Instax 8 camera. YES. Now there is an Fujifilm Instax Mini 70 camera in market. Little bit expensive, cost is around $125 but it’s a beauty. I don’t know about features but I hope it has lot more than mini 8. You have to add Polaroid ZIP camera and Fujifilm Instax Mini 70 camera to this list. Both these cameras deserve a place since those are cheap and latest models in market. Happy New year everyone ! What is the latest cheap instant camera out there in market currently? I’m searching for one under $200 which use those latest types of photo paper. Doesn’t matter if it’s a cheap Polaroid camera or Fujifilm Instax. © 2019 InstantCamera101.com. All rights reserved.